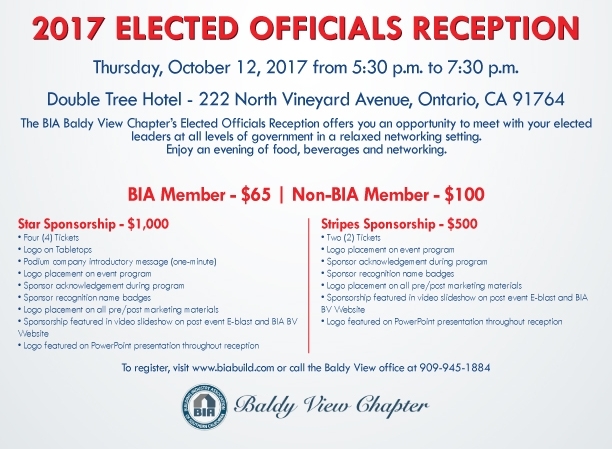 The BIA Baldy View Chapter’s Elected Officials Reception offers attendees an opportunity to meet with Elected Leaders at all levels of government (federal, state, and local) in a relaxed networking setting while enjoying a cocktail and hor’dourves. CANCELLATION POLICY: Deadline to cancel previously made reservations is 5 PM, FRIDAY, OCTOBER 6th. Registration not CANCELED by this time including NO SHOW registrants are NON-REFUNDABLE and will be billed per company policy. A registrant can substitute another person if they cannot attend.